Mmm . . . spaghetti. It's perfect for big groups. It's easy to throw together. The possibilities are endless. I picked up a jar of puttanesca sauce a few years ago, and I have never gone back to the standard marinara. Some of the store-bought sauces are delicious (Emeril's Puttanesca is my personal favorite), but I've included a great recipe if you're in the mood for a little homemade goodness. Spaghetti with Sausage Puttanesca Sauce 1 package thin spaghetti 1 lb. ground Italian sausage 1 jar Emeril's Puttanesca Sauce (or sauce recipe below) Brown ground Italian sausage in medium sauce pan. Add sauce and let simmer. Add spaghetti to boiling water. Cook to desired tenderness and drain. Serve pasta with sausage puttanesca sauce on top. 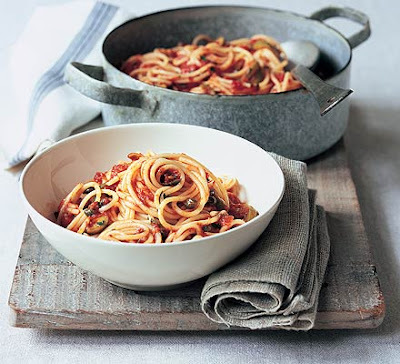 Homemade Puttanesca Sauce originally featured in Domino magazine ½ cup extra-virgin olive oil 4 garlic cloves, peeled and cut in half 6 plum tomatoes, chopped 5 anchovy fillets (about half a tin), finely minced ½ cup pitted black olives, drained well, chopped 1 tbsp. drained capers, chopped 4 sprigs fresh parsley, stems removed, chopped 2 sprigs fresh oregano, stems removed, chopped 1 tsp. crushed red pepper Place the olive oil and garlic cloves in a small bowl and let sit to infuse the oil. In a large bowl, combine tomatoes, anchovies, olives, capers, parsley, oregano and crushed red pepper. Stir well. Remove garlic cloves from the oil, discard them and add oil to the large bowl. Can serve hot or cold.